How do I get to the airport?” he asked the shopkeeper in Jorpati. He then moved to the next sauji and started the same conversation. All day long he went on asking people the same question until he reached Ratna Park. The shopkeepers would smile at each other and declare, “That one’s crazy.” Unknown to the saujis, it was Mark Zimmerman’s unique method of practicing learning the Nepali language. With the help of a friend, that morning, he had taped practice conversations on a recorder to prepare himself before moving out into the street. “I learnt more from those saujis than from all the Nepali classes I took,” says the tall, gentle American doctor peering through his glasses. 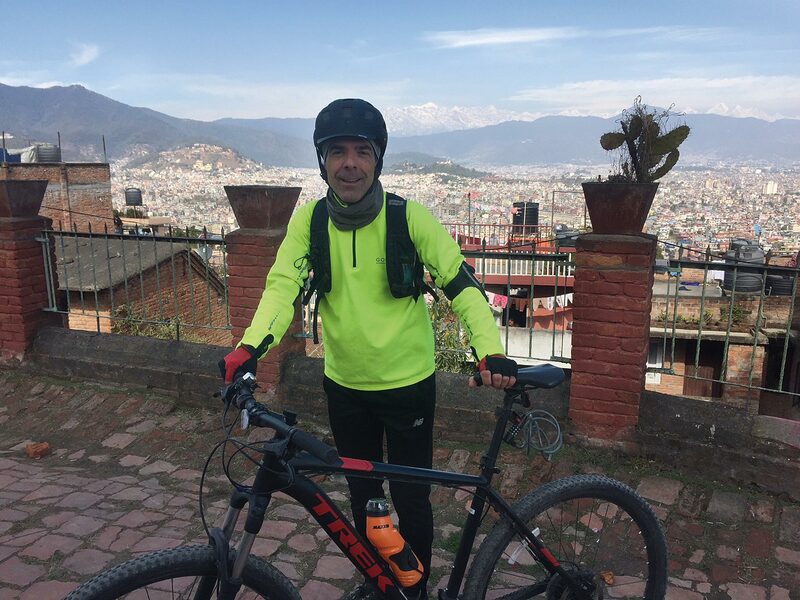 Mark came to Nepal expecting to volunteer for some months as a doctor. Having completed Internal Medicine Internship in Syracuse, New York, he was full of enthusiasm. But life is full of ironies and a country desperately in need of qualified doctors had no job to offer Doctor Zimmerman. He visited Bir Hospital, Peace Corps., V.S.O. and finally reached United Mission to Nepal. Here at last there was a glimmer of hope. “There may be a vacancy in Patan Hospital, keep in touch,” he was told. It so happened that a US doctor was about to leave Nepal and they would need a replacement. Eventually Mark did take her place and joined the United Mission to Nepal (UMN). UMN had closed Shanta Bhawan, which had served the country for twenty-seven years, and a new bigger, better-equipped hospital known simply as Patan Hospital, had been built to continue its services. Since its inception the hospital has been run jointly by UMN, HMG and a committee formed of local residents. UMN was founded on 5th March 1954 by a group of Methodists, Presbyterians, Baptists and others who came together to form a unique alliance called ‘United Mission’. Born on 6th July, 1955 in Elkins Park, Philadelphia, USA, Mark David Zimmerman is the eldest of four children. Growing up in Philadelphia with a brother and two sisters, he spent countless hours playing basketball, “I used to play in the neighborhood until the lights went out at midnight. Yes, I’ve always been crazy about basketball since my childhood days.” He attended William Tennent High School from 1969 to 1973 where he was appointed captain of the Varsity Basketball team and was a National Merit Scholar Finalist. Not surprisingly, he has built a hoop at his house in Patan. Mark’s interest in the study of medicine goes back to his school days. When a hospital came up in the neighborhood about 2 km from his home, he immediately went up and applied for a job. At his first job there, he helped patients who needed physical support and aided the nurses doing menial tasks. The encouragement he received from the doctors played a major role in his growing interest in the medical field. He went on to the John Hopkins University where he spent the years 1973 to 1978 and graduated with honors. There too, he represented the University on the basketball team and tutored the Inner-city youth. Then in 1979, Mark joined the Dartmouth Medical School in New Hampshire and by 1982 had become Mark Zimmerman MD. It was while attending Medical School at New Hampshire that he got the opportunity to go to Gambia in Africa for two months for his summer elective. After medical school, he completed his residency from the State University of New York in Syracuse and passed the diplomate from the American Board of Internal Medicine in 1986. After hearing about Nepal and the hospitals here, he decided to try out medicine here. Telling friends and family that he would be back in six months, Mark flew to Kathmandu, but once in Nepal the months became years, and eighteen years later, he is still here. Mark then went home in 1989 and worked as an Emergency Room Physician at the A.L. Lee Memorial Hospital in Fulton before becoming Physician & Director at the Migrant Farm Worker Free Medical Clinic at Osuego, New York. In 1990, he was back at Patan Hospital as the Chief of Medicine (Physician). He led a team of about seven doctors and coordinated in-service training of doctors. He then chaired and co-founded the Infection Control Committee and also went on to organize Inter-Hospital Conferences (ACLS, ATLS). After living alone for much of his life, Mark was on the verge of accepting his bachelor status when someone special walked into his life. In 1997, an Irish girl named Deirdre arrived from Ireland to take charge as a nutritionist. Working together, they fell in love and before long, tied the knot in 2000. They flew to Ireland for the official wedding and on returning to Nepal, a bhoj was planned at St Xavier’s School in Jawalakhel. Much fuss was made about how the bride and groom should arrive for the ceremony. Acquiring a buggy from the army seemed improbable and someone suggested hiring an elephant from the zoo next door. To Mark, it sounded all too royal and it was eventually decided that a rickshaw would suffice. Preceding the entourage was the usual noisy brass band that accompanies most Nepali weddings. In the years that followed, the Zimmermans were blessed with two sons, Zachary who is now three, and little Benjamin who is just one. Mark’s second love is photography especially black and white and has an Ansel Adams reproduction adorning one wall in his office. His own handiwork hangs on the other walls. While in the US, he spent much of his time developing his own black and whites in his private dark room. He has been dabbling with photography since the age of fifteen and recalls how he would be oblivious to time passing by, “I would be in the dark room for hours until my mother finally called me for a meal. I would be so engrossed in trying to make a perfect print.” Besides photography, he loves to listen to music and is an ardent Bob Dylan fan. Having read his autobiography, he says, “He doesn’t even mention his earlier works and those early albums were so good,” with disappointment in his voice. The temptation to ask if he was related to Bob Dylan (formerly known as Robert Zimmerman) was irresistible. “No, but in college I used to give girls the line that I was his cousin,” he confesses, smiling. Hiking around the surrounding mountains of the valley is his other pastime and has walked up to Chadragiri and Champadevi many times. Mark talks of the wonderful family atmosphere within the Patan Hospital. “Everyone is a didi (elder sister) or dai (older brother) or mama (maternal uncle),” which typifies the friendly, enjoyable working environment. This enviable environment was inherited from Shanta Bhawan, which was established in 1956 and was the forerunner of Patan Hospital. Shanta Bhawan was closed in 1982 and its services and staff moved to the new hospital. According to Mark, a thousand patients from all over the country are attended to each day. Being able to make some difference in the lives of his patients, he finds great satisfaction working in the hospital. He has served as Medical Director since 1998, and has a staff of over 600 including 70 doctors running the hospital. His inspiration came from two very good doctors he has worked with in Patan Hospital in the past, Dr.Trevor Strong and Dr. Frank Garlick. The Medical Director talks enthusiastically of a new maternity ward, which will strengthen the services at Patan Hospital, and relates the story of Nick. Nick Simons traveled and worked for one year (2002-3) in Nepal and on reaching home, had talked of the beauty of this Himalayan country to his parents. Some months later he died in another popular tourist destination, Bali. “In the name of their son, the Simons family is now funding the maternity ward, and is also working on setting up the Nick Simons Institute or Rural Health Care Training with the aim of training government health care workers from all over Nepal,” informs Mark. “In a way, Nepal has become my country now,” says Zimmerman, “And when I go to the US for a visit, it seems like a foreign country.” He visits at least once in four years, which is a mission policy. “In 2004, we visited seventy different locations in the US giving talks on Nepal and raising funds for the hospital,” he adds. Although he has been working in Nepal since 1986 and speaks both Nepali and Newari well, he has to apply for a fresh visa each year. He feels he has learnt much about life from the Nepali people and has found the Lord in this Himalayan kingdom. He would love to stay. He dreams of one day living far from the city, basking in the splendor of nature and enjoying a good view of the mountains.